"I've kissed Iris West twice and both times I've managed to erase it from existence." When Barry returns from Flashpoint world, nothing is quite the same - or is it? This episode shows Barry grappling with the morality and ethics of time travel, and began to answer the question of what happens when you go back in time and return home. The season premiere was a transition episode, bringing us from last season to this season. It also set up a very high bar to meet when Barry decided to sacrifice his mother and return 'home'. Barry received this huge, enormous gift. He had to pay a price. He wasn't willing to pay it. He went back to his old world. This required a higher price. This episode, I figured, had to be the payoff for that premiere and the reset for the coming season. Let's take Barry's mother. What would be your reaction to giving mother's life back to an insane yellow-leather-clothed maniac? Essentially re-sentencing her to death, AFTER three months of living with Mom in an apparently greatly-friendly way, and with the thinking love of an adult, not with the idolization of a child? Not to mention your father? I figured this episode would be all about working out that trauma. I could see Barry realizing he had to do it to save the world, but even when he has a clear goal our hero usually has a lot of internal struggling to do. 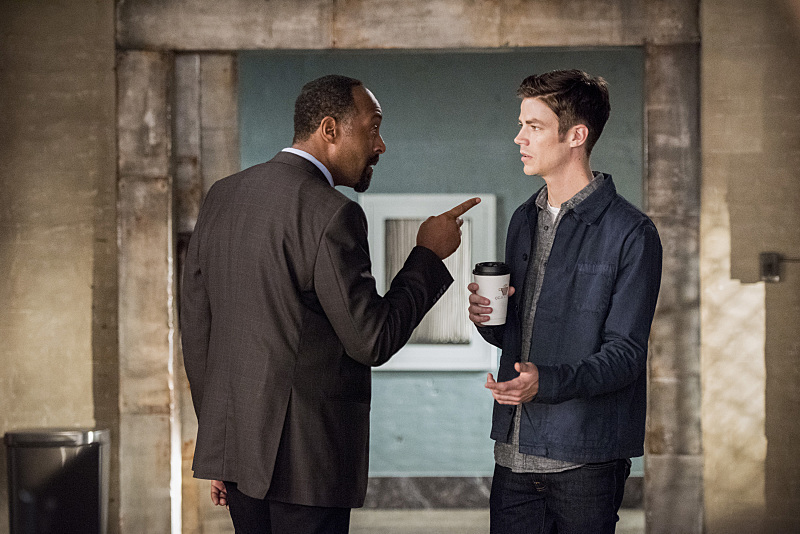 Instead, this episode saw Barry working out a much deeper drama which may have repercussions for the entire season. See, unfortunately Barry's overwhelmed by how much things have changed. Part of the change even impacts his best friend, who's lost his brother in a car accident and wishes Flash would rescue him. Barry, overwhelmed by his lack of support, goes back and tries to change the timeline again. 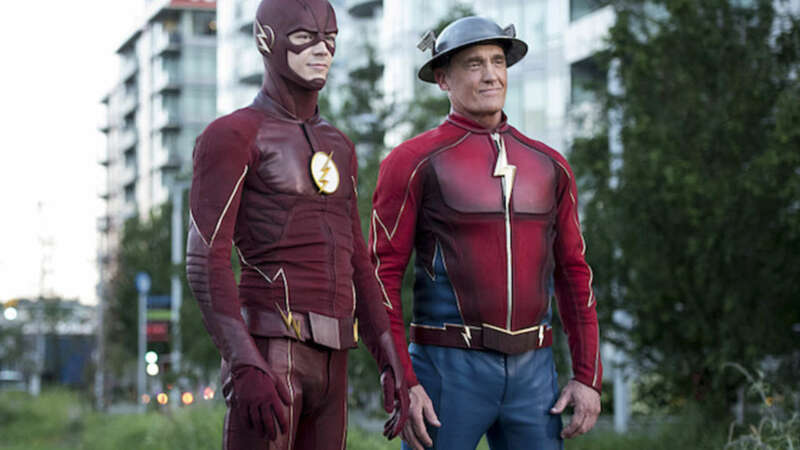 He's prevented from doing so by another Flash: Jay Garrick of Earth-2, who reminds Barry of the lessons he claims to have learned. Essentially, in this world, any attempt to change the timeline simply results in a new timeline. "You can't go home again," and so it is here. Barry does not want to listen or accept this at first, but Jay gets the truth into Barry's head. This moment is the core of the problem: Barry's arrogance. Barry has started to believe he has the power and the right to just go back and change whatever suits his fancy. To Jay, this isn't heroic, but cowardly. Dealing with the fallout Barry's put in place is more heroic of Barry than hiding. Barry's taking do-overs. Jay's speech gets through to Barry: they're not gods. At the same time, nothing is straightforward in Central City. The Edward Clariss of this world is having nightmares, remembering his life in Flashpoint world and his death there at the hands of the Flash. He's also hearing the call of someone calling themselves Alchemy. Doctor Alchemy is a strange creature, easily far more creepy than Edward Clariss. When the two finally meet, Doctor Alchemy re-gifts Clariss with his speed as the Rival we saw in Flashpoint world. The Rival is as dismal in this episode as he was in the previous world; Alchemy is a lot more malevolent - and able to completely wipe out someone who, just a few minutes ago, was seriously pushing the limits of the Flash. Is Edward Clariss dead? We haven't seen the body yet. I wouldn't be surprised if we see more of the Rival. During all this Barry and Iris are struggling to find their way as a couple. By the end of the episode they finally have the breakthrough they want; the team is together, the rift between Iris and Joe seems healed, and the rift between Barry and Cisco is fading. It feels as if Flashpoint world is rapidly becoming a dream. The most lasting changes seem to be Julian, Cisco's brother - and Caitlin Snow, who's apparently one of the people coming to deal with powers from the other world. So does this qualify as the 'payoff'? I somehow think we only saw some of the payoff with this episode, and there's going to be a lot more coming down the road. Dr. Alchemy. Scary costume, but I wonder if he's Eobard Thawne? Barry and Cisco working together at the end. Great, great scene. Felicity: There's a whole new guy at work that you didn't even know about? Barry: Yeah. And he's worked there for almost a year. And he doesn't like me very much, apparently. Felicity: Well, that's impossible. Everybody likes Barry Allen. You're like pudding. Everybody likes pudding. Three marks out of five. While I enjoyed the episode the overly-pat ending and cheap reappearing villain didn't thrill - although looking forward to their take on Dr. Alchemy and the rest of this upcoming season! I've been patiently, sort of, waitng for this review. I didn't like season 2 as much as season 1. Not sure why, it was not as funny? Too twisty? Anyways, I did like most of this premiere. 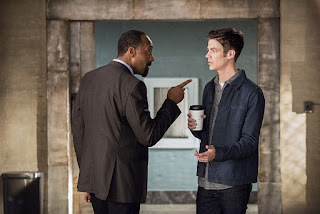 I thought it was great that the episode was focused on the human drama of Barry's life and the people around him, instead of some foe that Flash has to defeat. I don't watch Supergirl to watch her fly around, and I don't watch The Flash to see him run faster or hit harder than the bad guy. I watch for the human factor and the impact that events have on the character's lives. I thought that this episode showed the real consequences of Barry's actions, and it was a little sad that he has to live with this reality. It was pretty good, though, his zipping around arranging dinner with everyone and the animosity with the new guy. Who wouldn't like Barry? He's so sweet. I thought Sisco was being a little harsh with Barry, but I've never lost a sibling. Overall, it was a promising start to the season. Thanks Mallena! I try to keep on schedule but some weeks the life takes over. Comments like yours give me more motivation to fight back tho! One addition-was anyone else slightly impressed by Tom Felton? He showed some acting chops tonight, and all this time I thought it was all wand. I wonder if the ramifications of Flashpoint are just too much? To let her die anyway, or again, feels like it would be overwhelming. Anna, your handle just made me laugh out loud. I have not watched this yet because Netflix doesn't have season 3 until done but I am so glad to see the speech from Jay to Barry! I want to become one of those time wraiths myself and chase down the writers!